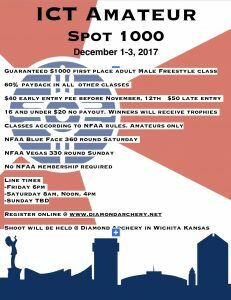 Classes are defined by NFAA rules. Classes available are the following. Freestyle, Bowhunter, Traditional. Youth 17 and under will shoot 20yrds. Senior will be 50 years old and older. 40 shooters per line time. First come first serve on reservation of line time. 160 total shooters is the max. Email blaken@diamondarchery.net with any questions or concerns.